When I look at the Samadhi and see what is happening there, I am astonished to find this column of dazzling light vibrating with an energy and a transforming force. It rises like this—(Mother makes an upward movement with the hands) with a splendour and a brilliance like an effusion of light from the length and breadth of the Samadhi. It is the New Light materialising. 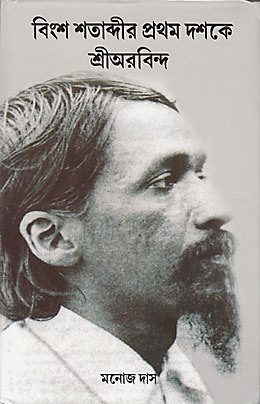 Sri Aurobindo: Selected Photos presents four categories of pictures: Sri Aurobindo’s youth in England and his political period before imprisonment; his time in Alipore Jail and his early stay in Pondicherry, pictures taken by Henri Cartier-Bresson in April 1950; and pictures of his Mahasamadhi. The Cartier-Bresson photographs, taken in the course of three days, also include some photos of daily life in the Ashram at that time, and several of these are reproduced in this book. 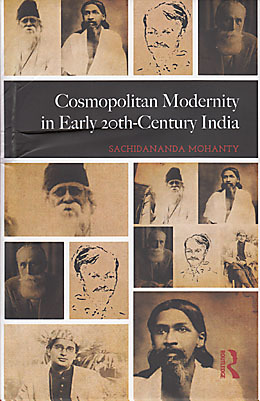 Cosmopolitan Modernity in Early 20th-Century India is a narrative study of the social and political histories of six thinkers, writers, and activists of the early twentieth century. In an effort to redefine modernity, the author explores the lives of these men and their connections to Sri Aurobindo’s thought, showing how the seeds of cosmopolitanism and cultural citizenship were already planted in India at that time. This is the first in a series of volumes that present all of the 472 paintings on Savitri made by Huta under the Mother’s guidance. 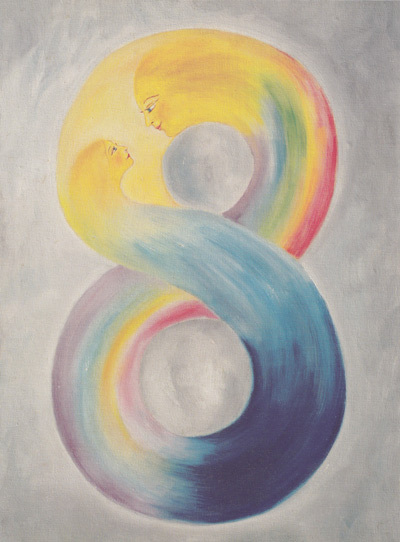 From 1961 to 1966 the Mother and Huta meditated together on lines chosen from Sri Aurobindo’s Savitri, and when an image appeared to the Mother she described it to Huta with the help of a few strokes. Huta then completed the work in her studio as an oil painting. 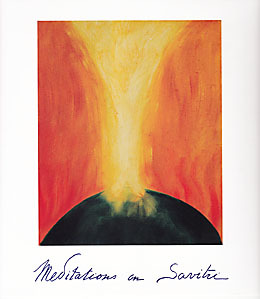 The Mother named the series of paintings Meditations on Savitri. This volume of 127 paintings accompanied by the corresponding lines from Savitri, covers the five cantos of Book I, “The Book of Beginnings”. From 1962 to 1966 these paintings were published in book form in four volumes. However, many of the paintings were redone prior to a 1967 exhibition, and these are included in the present book. 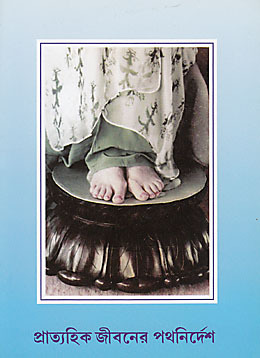 The 145 black and white photographs in this book have been selected and arranged in an attempt to bring out the depth of spiritual vibration that radiates from Sri Aurobindo’s photos. There are four categories of pictures: Sri Aurobindo’s youth in England and his political period before imprisonment; his time in Alipore Jail and his early stay in Pondicherry, pictures taken by Cartier-Bresson in April 1950; and pictures of his Mahasamadhi. Most are unretouched photographs, arranged without chronology or theme or identifying remarks. At the back of the book the pictures are reproduced in smaller size with dates and some brief comments. Using the lives and works of Irish poet and spiritualist James Cousins, French thinker Paul Richard, Dilip Kumar Roy, Rabindranath Tagore, art historian Ananda Coomaraswamy, and revolutionary-intellectual Taraknath Das, the author explores their connections to Sri Aurobindo as regards the concepts of cosmopolitanism, citizenship, and modernity in India. He discusses issues of cosmopolitanism concerned with moving beyond literary, cultural, and ethical borders towards a more universal world view and how they are closely connected to the idea of cultural citizenship which these six figures believed in. He argues that by becoming bridges between cultures and ways of life, East and West, they brought the best of their cultures into a synthesis and were truly modern cosmopolitans. 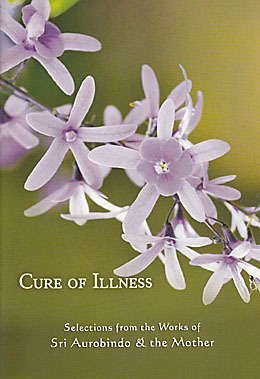 Gathered from the Mother’s writings, the selections in this small booklet offer guidance to those who embark on a spiritual path. 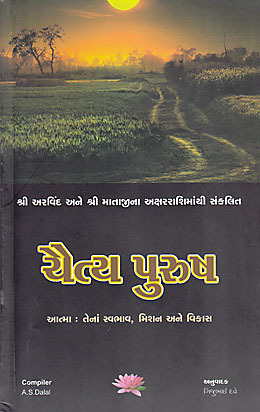 Passages deal with subjects such as what it means to be vigilant in one’s sadhana, why it is more effective to concentrate in the heart, how to widen one’s thought, the role of wealth as a force of Nature to be utilised in building the new creation, and how to offer one’s wrong movements to the Light. 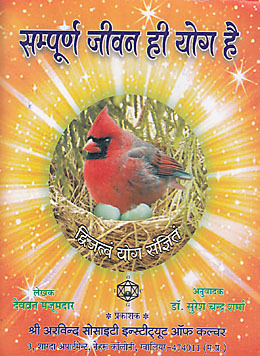 Hindi translation of Samagra Jeebanee Yog. 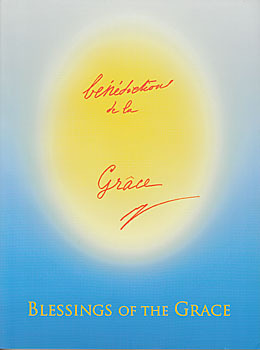 When first published in 1972 as Sri Aurobindo in the First Decade of the Century, this book brought to light the then unknown private correspondence relating to Sri Aurobindo between Governor-General Lord Minto and Secretary of State for India Lord Morley, as well as the debate on Sri Aurobindo in the British parliament. 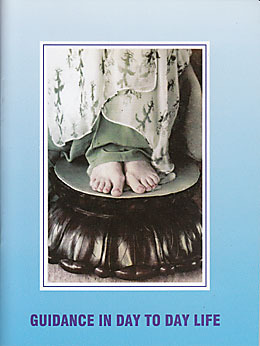 This book provides a unique insight into the politically active phase of Sri Aurobindo's life. 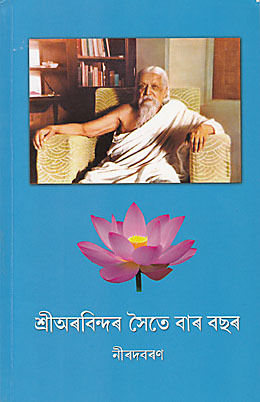 Assamese translation of Twelve Years with Sri Aurobindo. Nirodbaran served Sri Aurobindo as an attendant and literary secretary from 1938 to 1950. This hagiographic classic is an account of that period of intimate personal contact.